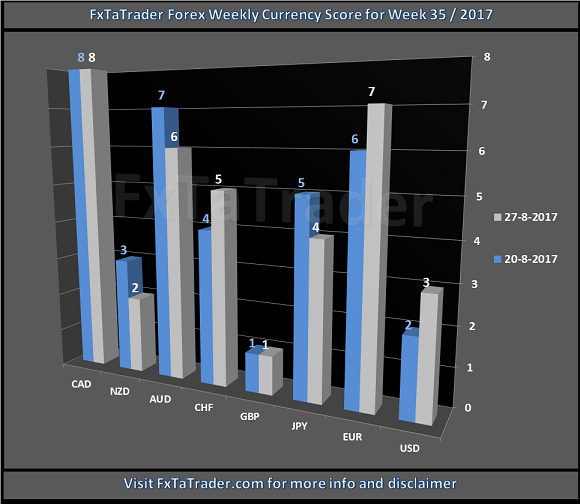 The Top 10 of the Ranking and Rating list for the coming week shows the following stronger currencies being well represented for going long: the CAD(4X) followed by the EUR(3X) and the AUD(2X). The weaker currencies are the GBP(4X) followed by the NZD(3X) and the USD(2X). Strong: EUR, NZD and CAD. The preferred range is from 6 to 8. Neutral: AUD and CHF. The preferred range is 4 to 5. The Chart for this week is the AUD/NZD Daily chart. Price is above the Tenkan-Sen and clearly in an uptrend, the pair is rising and we may not have seen the highest price yet. A nice buy opportunity would be around the level of the Tenkan-Sen around 1,0860. This is also a level, see the yellow dotted line, where recent fractals and highs can be found before the price broke through. The target should be below the latest high which is currently at 1.0922 where Nr. 2 is. The MACD is looking fine and as long as it does not cross the Signal line the set-up remains valid. The 4H. chart may offer good information for the entry price. There is then a range of +/- 90 Pips from the levels discussed in point 1 to point 2 and taking profit there seems realistic. This is a pair that fits best in Point 3 of the Comparison Table Guide which you can also read here below. 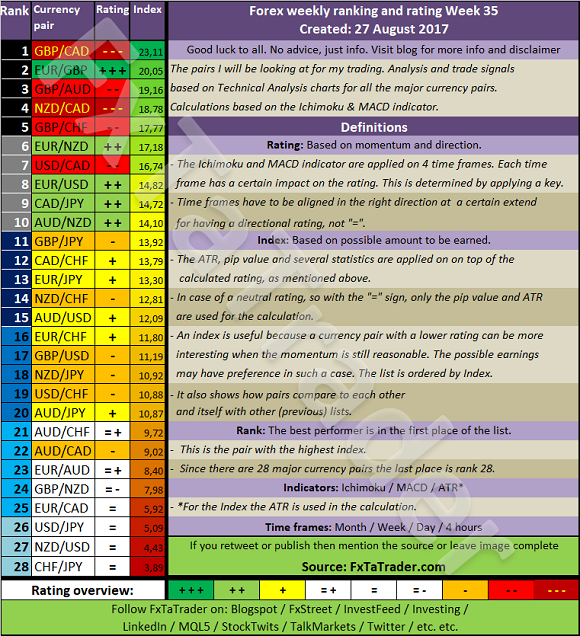 Only Neutral currencies are Approved against a better-classified currency when there is a Currency Score difference of at least +4. In the case of a currency worse classified, the Currency Score difference has to be at least -4. The AUD is a Neutral currency and the NZD a Strong currency. The Currency Score Difference is 4.